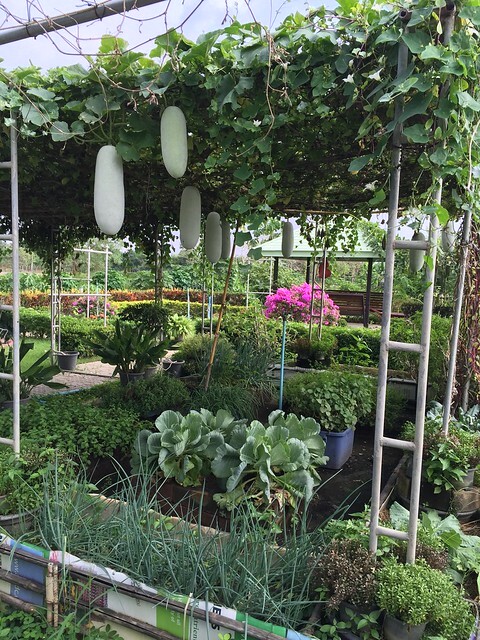 In November, I visited Kasetsart University and toured the Horticulture Innovation Lab Regional Center there and also the World Vegetable Center (AVRDC) demonstration garden nearby. It was great to see the new, central location of the Regional Center that showcases small-scale horticultural technologies. Students at Kasetsart University were using the technologies in their class. Sliced bananas were drying in the chimney solar dryer (see above), next to a demonstration of solar-powered drip irrigation. Also on the site were a cabinet solar dryer and a zero energy cool chamber that were previously tested as part of a Horticulture Innovation Lab project that evaluated postharvest cooling and drying technologies. 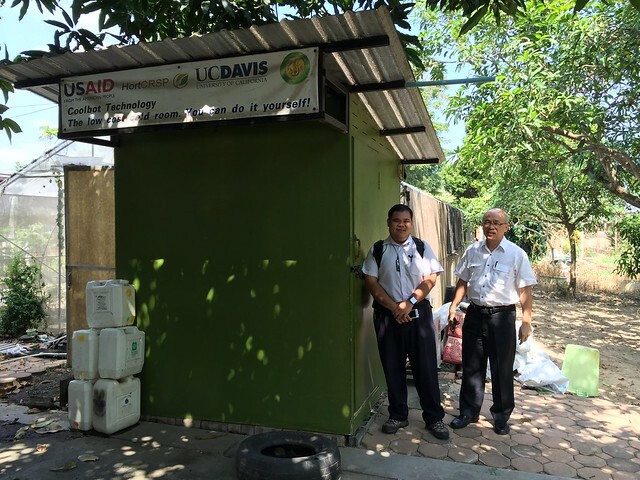 At the Kamphaeng Saen campus, Jate Sathornkich and Dr. Jingtair Siriphanich showed me the low-cost cold room they have equipped with a CoolBot controller to allow the air conditioning unit to cool to 2°C. The university’s Horticulture Club uses the cold room to store fruits and vegetables that they grow on adjacent land. 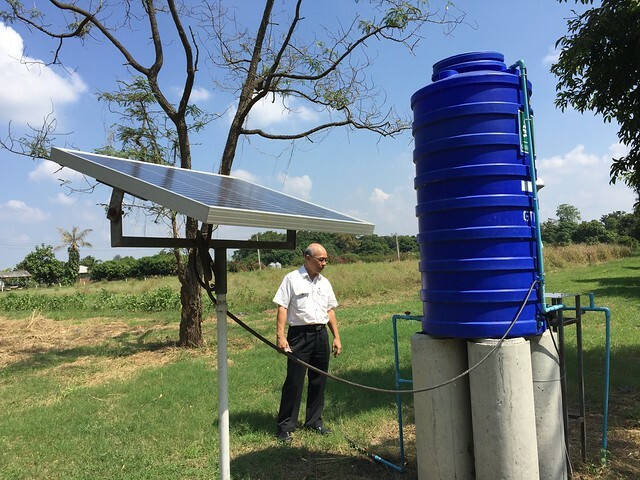 Dr. Siriphanich also showed me a solar-powered drip irrigation system with water storage tank that the team is using at the Kamphaeng Saen campus. He explained that the water hyacinth in the stream nearby is causing problems with the pump. The plants grow so much that they eventually push the pump out of the water. They have had to build a metal cage around the water pumps to keep the water hyacinth away. 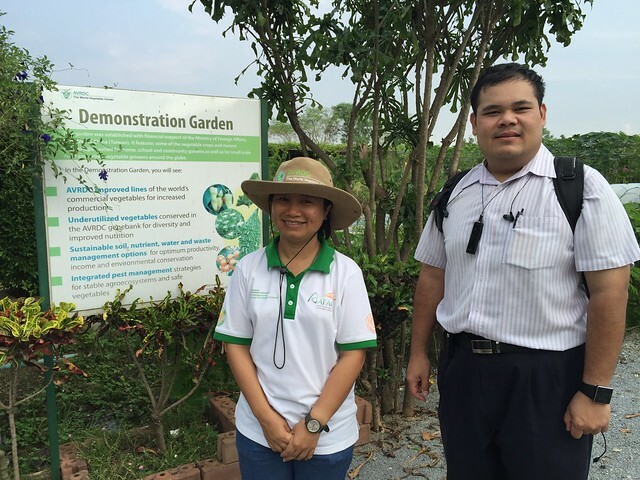 I also had a chance to tour the AVRDC Demonstration Garden, while at Kasetsart University, to see the array of underutilized vegetables, AVRDC-improved varieties, and IPM research focused on developing strategies to control key insect pests on vegetables. It was wonderful to see these horticultural crops arranged at the demonstration garden in a variety of inviting and beautiful ways. Not only is this a lush garden full of indigenous varieties and improved vegetable lines, but everything is edible!